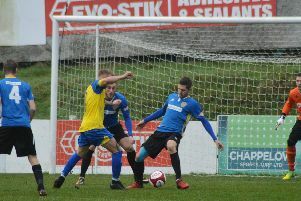 Sheffield FC are facing a fixture backlog after seeing both their games over the New Year period postponed. Club’s match at Rainworth Miners Welfare on New Year’s Day was called off due to snow. Then last weekend’s scheduled home match against Carlton Town was postponed following an inspection by local referee Alex Pashley despite a magnificent effort by ground staff and dedicated volunteers to get the game played. It was the third game at Dronfield to be postponed due to an unfit pitch adding to those against Coalville Town and Stafford Rangers. Sheffield are already behind on their fixtures compared to the rest of the Evo-Stik Division One teams having played 20 of 42 league games with only Leek Town having played fewer (19), while most teams have played 25. Club have played just eight league games at their Dronfield ground and while it is far from a crisis, with the likelihood of more poor weather over the forthcoming winter weeks the situation could become a whole lot worse. Meanwhile, Former Sheffield boss Curtis Woodhouse this week parted company with Division One South rivals Goole AFC by mutual consent. The 34-year-old had been in charge at the Victoria Pleasure Grounds just short of 12 months since replacing David Holdsworth last January. However, the continuing financial pressures on the club brought about since former owner Baron Bloom left earlier in the season necessitating a cut in the wage bill that would impact on team selection, Woodhouse decided to leave his post following a meeting with club officials.